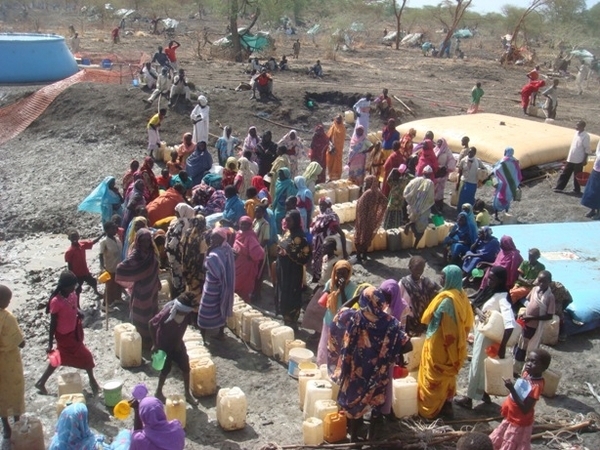 Since December, water shortages have plagued the humanitarian response in the two refugee camps in this remote and barren part of Upper Nile State. Doro camp is almost full to capacity and in Jamam camp people have under 7 litres of water per day - less than half the minimum required standard in emergencies – and almost 40 percent of consultations in MSF’s clinic at the camp are for diarrhoea. A long-discussed third refugee camp, at Yusuf Batil, is being prepared, but currently provides only enough water for three or four thousand refugees. With the existing camps either full or with insufficient water, there is an extremely pressing need for an alternative solution to be found. For now, the new refugees are gathered under trees at a place called Rum. Only a few have scraps of plastic sheeting for shelter. Since last week MSF has provided medical care for the most serious cases, including 214 consultations for diarrhoea and 34 for children with acute malnutrition. The refugees are exhausted and have spent months in the bush hiding from the fighting. Many tell harrowing stories of the weak or injured falling by the wayside during the long walk, which took a minimum of two weeks, and for many took substantially longer. “We walked with the whole family for more than 17 days with very little water or food,” says a father surrounded by his children. “A nightmare scenario is starting to unfold,” says Jean-Marc Jacobs, MSF’s deputy head of mission. MSF will provide medical care for the new refugees, and will provide emergency water for the few days left before the water sources at Rum are empty. But during this time, we urge UNHCR and the other humanitarian organisations in Maban county to explore every avenue to find a place for these refugees. concrete plans backed up with appropriate resources for when further refugees arrive. Since November 2011 MSF has been running a substantial emergency medical operation for the refugees in Upper Nile State. The team now counts more than 40 international staff and 250 local staff on the ground running two field hospitals and providing more than 3,000 consultations a week. The team also runs mobile clinics to the border crossing points and undertakes water treatment and distribution as an emergency life-saving measure.